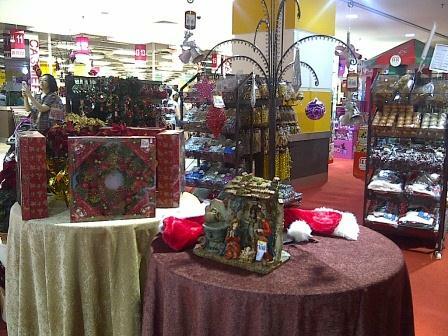 This year, Jaya Jusco AEON is selling quite a large selection of Christmas trinklets and decorative items. I’ve always like the taste of 2 of my former bosses. Their Christmas trees are very different from others- stylish. 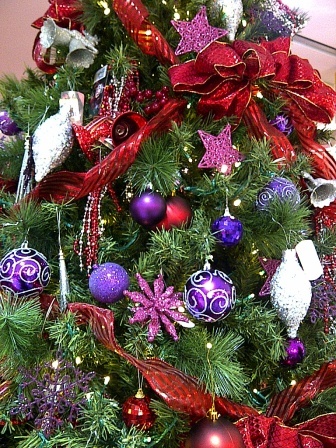 The tree is white and they would decorate it only using one or two theme colors. That’s it. It means they would buy trinklets of the same colour shade and it really made the tree look very special. You can take that into consideration when planning to decorate your Christmas tree if you have a budget- like my former boss bought a good quality tree that can easily be assembled and then after Christmas to be dismantled and store nicely in the box. And invest in good quality decorations that looks classic (and does not look cheap). He used only white and blue theme and his Christmas tree stood out from the rest of the other offices. Many people would come over to admire his tree. 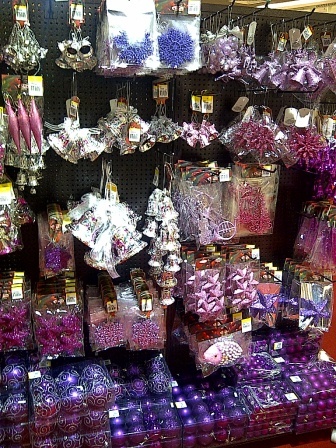 These items are sold in Jusco- above is the purple theme. It is one of my favourite colors and I can’t help but be drawn to it. 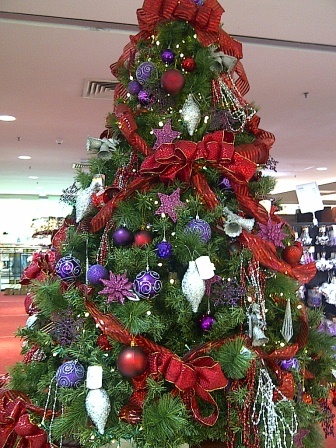 But using a traditional gree Christmas tree, Idon’t really think the deco would stand out. It would, however be obvious on a white Christmas tree. 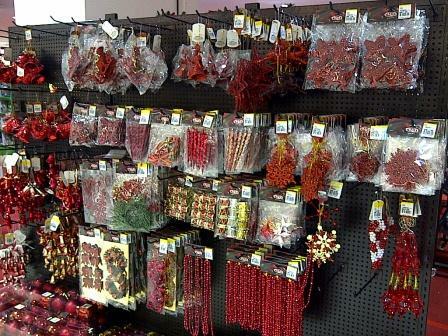 Above are the decorative Christmas tree items in red colour. 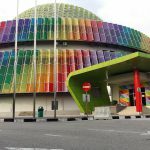 And above, you have the gold and green colours. 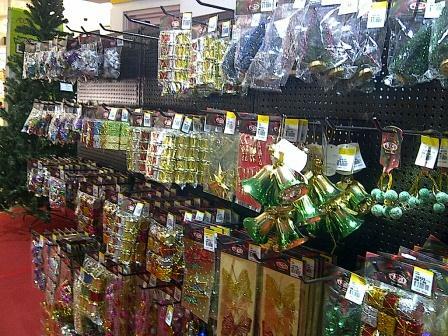 The store also invested in a good display- ample walking spaces. 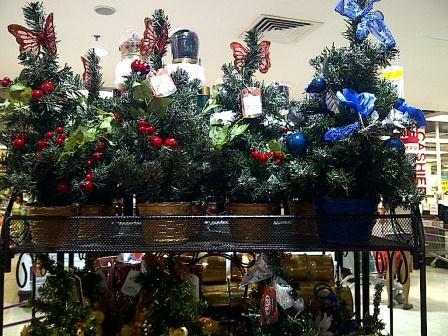 For those who cannot afford a huge tree, they can buy the basic mini versions for about RM29.90 each, I think. Then can add one’s own decoration. When I was young, I bought the raw Christmas tree wires from Nam Thong, a craft supplier located in Petaling Street and made my mini trees from scratch. I also made some of the decorative items. Of course my trees were quite amateurish. The ready made ones above looked much nicer. 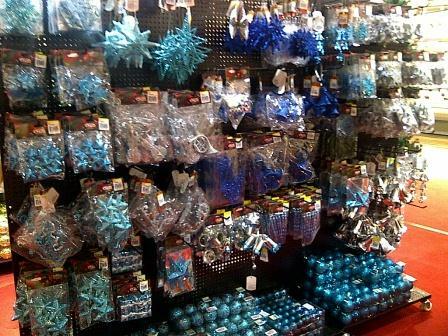 And above, are the blue themed decorative items. Lots of varieties to choose from and I reckon the quality are better. 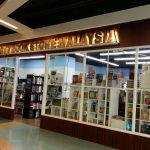 But you can also search from other stores instead of buying all from here. Sometimes Christmas decos from hypermarkets are more affordable but if you want to achieve a more stylish and classic look, then some pieces (not all) must be more striking (and expensive).